Usually, I’m against this whole “New Year, new me” B.S., but after the wild ride of 2016, I think everyone is more than ready to restart fresh. I mean, I’m not making any promises to lose weight or eat better or, the worst, not drink as much because, let’s be honest, no one likes a skinny, sober b*tch. I read that on some meme so it must be true. After Christmas break I decided I need a redo. Not sure if I had that coming-to-Jesus-moment when I was whacked upside the head by a metal door (which I am assuming is the equivalent of taking a punch from a pro boxer) or when I won a nice cash prize from the scratch-off lotto ticket my uncle gave me, only to wake up the next day to find that my car won’t start. Either way, I’m ready to try it again this year. But first, let’s look back on all the good times and what’s happened in the last couple of weeks too! 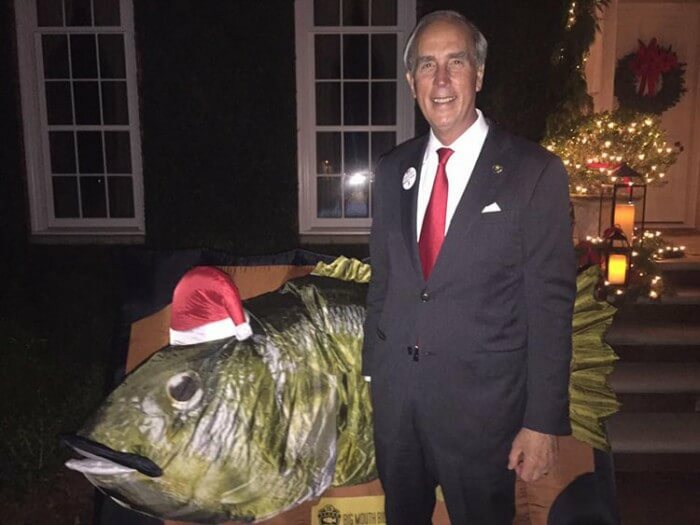 (Photo | Sandy Stimpson/Facebook) A large singing bass has been making its way around town and even stopped by Mayor Sandy Stimpson’s house. We’re told the bass has made stops at the homes of the Coopers, Vickers, Kumars, Barbers, Van Antwerps, Israels, Hales, Ringolds, Martins and even Mayor Sandy Stimpson. We hear “Billy” attended at least one holiday party, where of course he was a huge hit. One delivery mission had to be aborted, however, as his handlers felt they were close to being shot. Luckily, that did not happen. No word yet on if Billy will make year-round appearances or be shelved along with the Elf until next Christmas. Only time will tell. Mr. MoonPie, aka Mobile City Councilman Fred Richardson, was spotted riding in the Dollar General Bowl Parade last Thursday night. If you will, take a guess at what the good councilman was throwing! If you guessed a marshmallow treat, then ding, ding, ding, you win! In case you forgot, Councilman Richardson is is all about THE MoonPie life. Remember how hard he fought to get the MoonPie Over Mobile, and how he loves to cut into the biggest MoonPie every New Year’s Eve and, shoot, Mobile is even opening a store downtown that sells Chattanooga Bakery MoonPies. With all that being said, my spies said they can’t be totally sure but they think they caught “marshmallow sandwiches” from him instead of official Chattanooga Bakery MoonPies. Gasp! Though my spies said the “sandwiches” were still tasty, this has scandal written all over it! Or maybe it’s just scandalicious! Another year has come and gone, which means some great things are to come again! For January last year, Mardi Gras and Senior Bowl kicked off the year strong. The good times rolled into February with Mardi Gras and every nerd’s favorite, Pensacon. Boozie can’t wait to see what clever things the fellas of Comic Cowboys come up with this year. They have some pretty good content, from the Luv Guv to the con-tree-versies. March was a busy month, with two Lagniappers’ weddings as well as Azalea Trail Run, St. Patrick’s Day Cajun Cook-Off and we can’t forget about Festival of Flowers and their fancy toilet paper that two ladies loved. April didn’t lack for fun either, with SouthSounds, crawfish boils and rounding out the month with Mullet Toss. May started out strong with Cinco de Mayo and Hangout Music Festival then came crashing down … well, crashing down for David J. Maloney, as he got booked for DUI though, the charges were later dropped. June was the month of the crawfish crackdowns. I still don’t understand that, but whatever. Jimmy Buffett at least provided us with Cheeseburgers in Paradise that same month at The Wharf. July can be summed up in two words: The Nappies! And just in case anyone forgot about Lagniappers’ amazing dance skills, let me remind you that in July the city of Mobile’s video of people dancing to “Can’t Stop the Feeling” came out. August was the beginning of all things beer: Top of the Hops at The Wharf, Old Shell Growlers opened and we closed out the month with Girls of Fall, which served beer. August wasn’t the only beer month. In September we had the Dauphin Street Beer Festival and, of course, the return of college football. September was also the month of the cannon controversy, where police pepper sprayed high schoolers and the hashtag #catholiceyesmatter was born. September ended and October began with TenSixtyFive Music Festival, a good way to start the month out strong. We also had two more Lagniappers tie the knot! It was a year for weddings around here. Rounding out the year was the Fair at The Grounds and Lagniappe falling from the top ranks in the Media Olympics. Still not convinced the other teams weren’t cheating, but whatever. 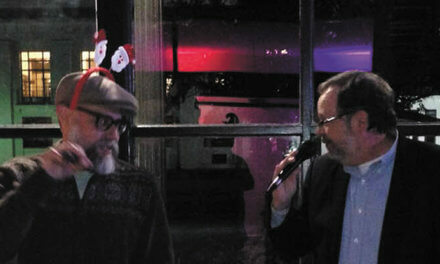 November was also the month for Hangout Oyster Cook-Off and the Mystery Concert at The Steeple. Boozie is still hoping for another surprise concert, that was fun! As far as December goes, you should still remember what happened unless you had too much eggnog! Happy New Year! Well, kids, that’s all I’ve got this week. 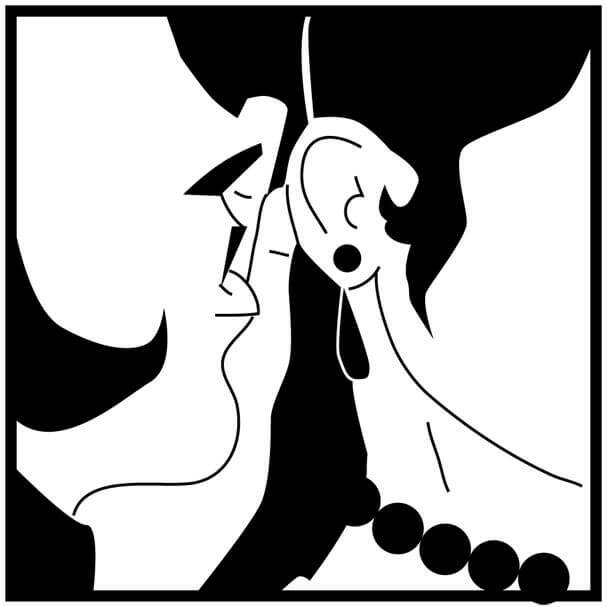 Just remember, whether rain or shine, dramatic or scandalous or just some plain ol’ New Year lovin’, I will be there. Ciao!